In 1 Corinthians 6:19-20, Paul told us that our bodies were not our own, but that we had been bought at a price. 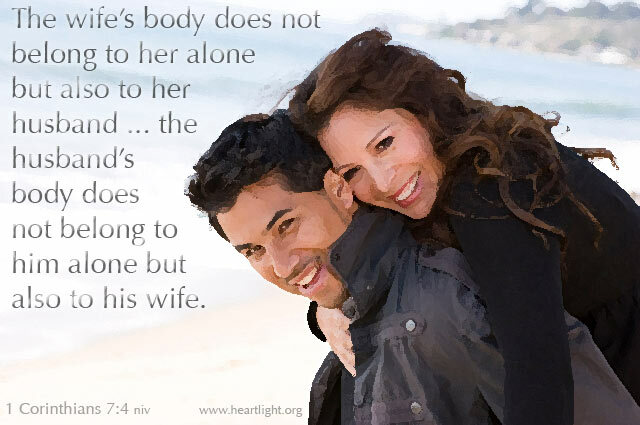 Once again in chapter 7, he reminds each of us that when we marry, our body is not our own, it belongs to our spouse. We are to use our bodies to bless, please, and bring fulfillment to our marriage partner. This is crucial to our marriage relationship and also to please God! Holy and loving God, Abba Father, please forgive me when I have cheapened myself by not treating my body as a gift to you. Whether it is in marriage or whether it is as a single, I want to use my body in a way that is holy and pleasing to you (and to my marriage partner). In Jesus' name I pray. Amen.